—The amount bid by James Sbrolla, the Toronto entrepreneur who won yesterday’s court-ordered auction for Captain John’s now-derelict restaurant boat. Sbrolla tells the Star that he will likely find uses for some parts of the boat and scrap the rest before the August 22 removal deadline. John Letnik, the boat’s former owner, once tried to sell it for $1.5 million. Towing it will be a BIG expense. 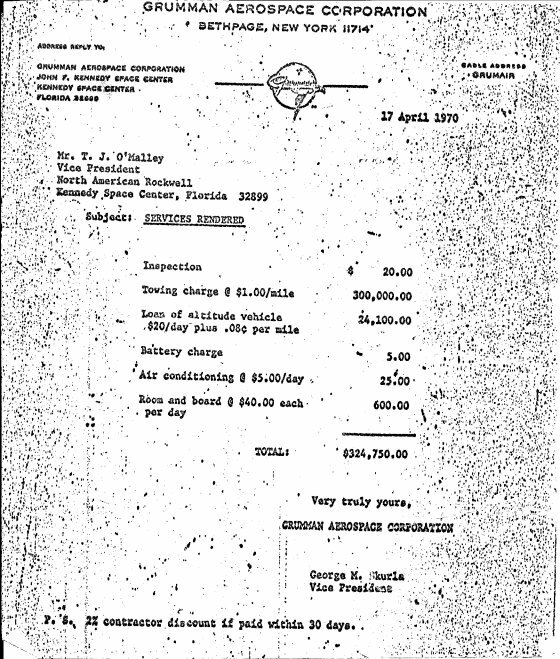 Look at this invoice from 1970, http://www.futilitycloset.com/wp-content/uploads/2011/06/2011-06-06-space-bills.jpg , which was done AFTER the “towing” the command module of Apollo 13 to relieve the tension.